Poinsettias and the holidays seem to go hand in hand. They are a bright and cheerful plant perfect for both giving and receiving. If you should happen to buy or receive one yourself this holiday season, give these 7 simple poinsettia care tips a try. When you give these tips a try, you can see that your poinsettia lasts and blooms as long as possible. 1. Pick the perfect plant. When buying a poinsettia, choose one that has plenty of buds in the center. This will ensure you many colorful blooms. You also want bright leaves that don’t show any signs of dryness or discoloration. 2. Remove any excessive wrapping. Many poinsettia plants come in foil wrapped pots. Remove this foil as soon as possible as it can interfere with the draining of the soil. It is wise to remove any decorative wrap the plant may have and keep it in a roomy, sturdy pot. 3. Opt for natural light. Keep the plant in a room where natural light is in abundance. It will need a good 8 hours of natural light a day to survive. Near a window that gets this sort of light is ideal, as long as the area isn’t drafty. 4. Stay away from appliances. Appliances such as televisions can cause the plant to overheat, so avoid setting your poinsettia on top of one. You also want to keep the plant away from any appliances that put off air or heat, as they can confuse the plant, dry it out, and cause it other health issues. 5. Do the touch test. Simply touch the soil to see if it needs water. If the soil is dry to touch, you may water it. Soil should be moist and well drained. Only water when it is dry to the touch and no sign of water is present. 6. Feel free to fertilize. You can fertilize your plant just as you would any house plant. Fertilize your poinsettia using basic plant fertilizer every 2-3 months. 7. Remember the 5 inch rule. After your blooms have expired, keep your plant cut back to about five inches in height. This way, it continues to bloom and bush outward instead of getting long and spindly. Between 2-5 inch stem size is ideal based on the size of the plant. Just like other house plants and garden plants, pruning helps the plant keep its shape. 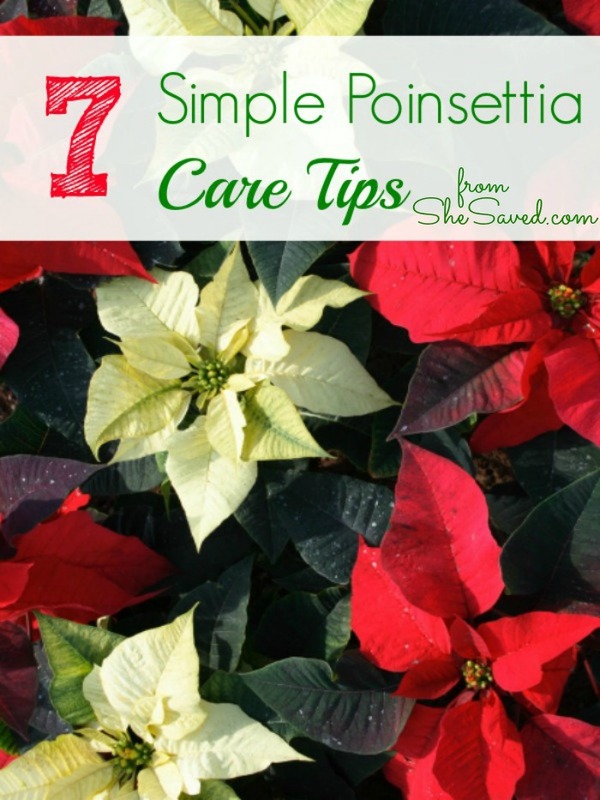 Taking care of your poinsettia plant is easy when you give these 7 simple care tips a try. Keep these in mind if you get a poinsettia plant this holiday season!